2. 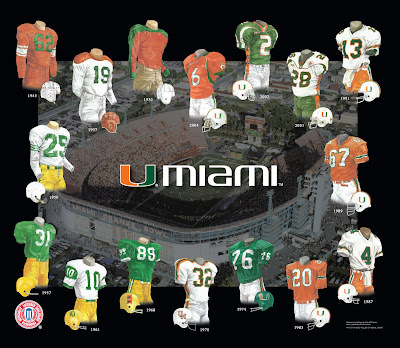 Please note that all of the actual original, one-of-a-kind artwork of the University of Miami football uniforms as seen in the poster above are actually available for sale. These watercolor paintings are truly beautiful, original watercolor paintings, and there are only 16 of them so please act quickly if you would like to buy one. These would make a wonderfully memorable, beautiful and completely unique gift for someone who loves Miami football. 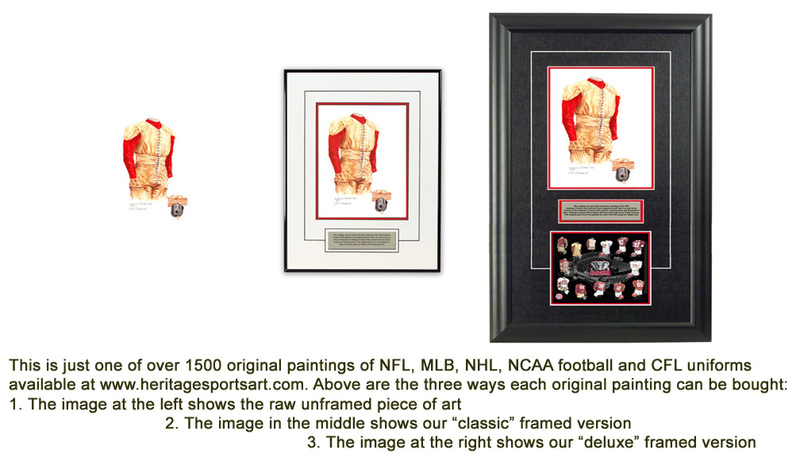 If you would like more information about this great artwork including the three ways you could purchase each piece, please visit our Miami YouTube video at www.youtube.com/watch?v=CJ1iaJ3CdQ8 or go directly to the artwork website www.heritagesportsart.com/Miami-Hurricanes-c85/ where you can see and purchase the artwork. The University of Miami is located in Coral Gables, Florida near Miami. It is the largest, most comprehensive private research university in the southeastern United States with a well-earned reputation for academic excellence. More than 15,000 undergraduate and graduate students call UM home. UM’s football program began in 1926 amidst a devastating hurricane that ravaged south Florida, killing more than 130 people and damaging over 10,000 homes. Although some controversy surrounds the actual genesis of the nickname - ‘Hurricanes’, the name and the program have prospered in the 80 plus years since football was first played at UM. The school has won five national championships (1983, 1987, 1989, 1991, 2001) and a Hurricanes player has won college football’s most coveted award - The Heisman Trophy - on two occasions (Vinny Testaverde in 1986 and Gino Torretta in 1992). UM has a reputation for producing great quarterbacks, among them are Fran Curci, George Mira, Jim Kelly, Bernie Kosar, Vinny Testaverde, Gino Torretta, Steve Walsh, and Ken Dorsey. The Hurricanes play out of the Orange Bowl Stadium. Completed in 1937 at a cost of $340,000, the stadium seats over 74,000 spectators. If Miami was nationally ranked in "The Top 20" (or Top 10 in some years) in a particular season depicted in the poster, we show the team’s ranking. That being said, prior to 1936 there was no nationally recognized poll ranking the nation’s top teams, so you will not see any rankings prior to 1936. This painting depicts the 1930 University of Miami football team uniform. The Hurricanes were coached by Ernest ‘Ernie’ Brett who led the team to a 3-4-1 record. The derivation of the name ‘Hurricanes’ is somewhat controversial. However, it is safe to suggest that Miami’s footballers came up with the idea sometime in 1926 or 1927 to name the team after the fierce storms that frequent south Florida. 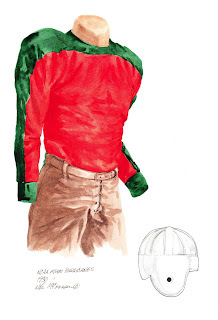 Hurricane players in 1930 sported orange jerseys with a green swath that ran up one sleeve across the shoulders and down the other sleeve. Players wore tan colored pants and a white helmet. No uniform numbers or lettering appeared on the front of the uniforms. In 1930, Coach Ernest Brett added a mechanical bucking machine to the Miami training schedule. 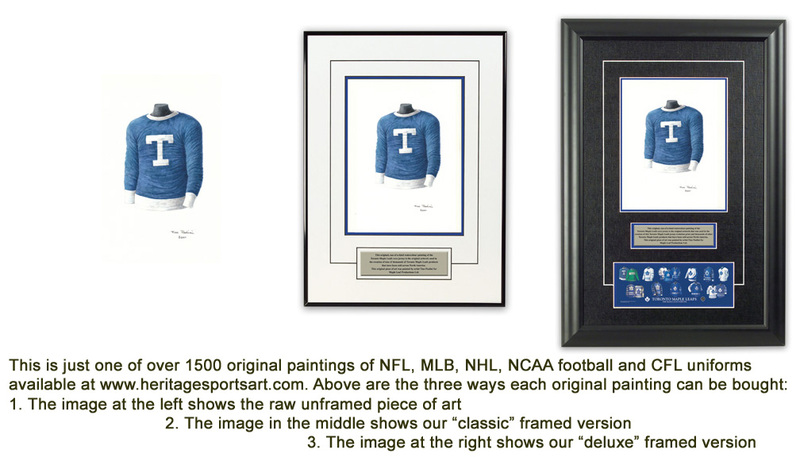 This painting depicts the 1937 University of Miami Hurricanes footballer - tackle, Tom Condon from Roselle, New Jersey. Condon played on both lines. He was also president of the University of Miami student body for 1937-38. 1937 marked the first year of Jack Harding’s six-year tenure as head coach of the Hurricanes. Harding led the ‘Canes to 4-4-1 record in ’37 and compiled a 35-22-1 record during his time in Miami. Hurricanes donned white, long-sleeved jerseys with an orange swath across both shoulders. Green numbers adorned both the front and back of the jersey. Players sported white pants and orange helmets for protection. This painting depicts the #62 University of Miami football team uniform from 1945 that was worn by Hurricane - Bill Frantz from Trenton, New Jersey. Frantz, who played tackle for the ‘Canes, was a three-time Lettermen at Miami (1945-47). The 1945 Hurricanes sported long sleeved, orange jerseys and orange pants. The jerseys feature green numbers on both the front and back of the uniform and three white stripes on the sleeves (at the elbow) of the jersey. Players wore white helmets for protection. 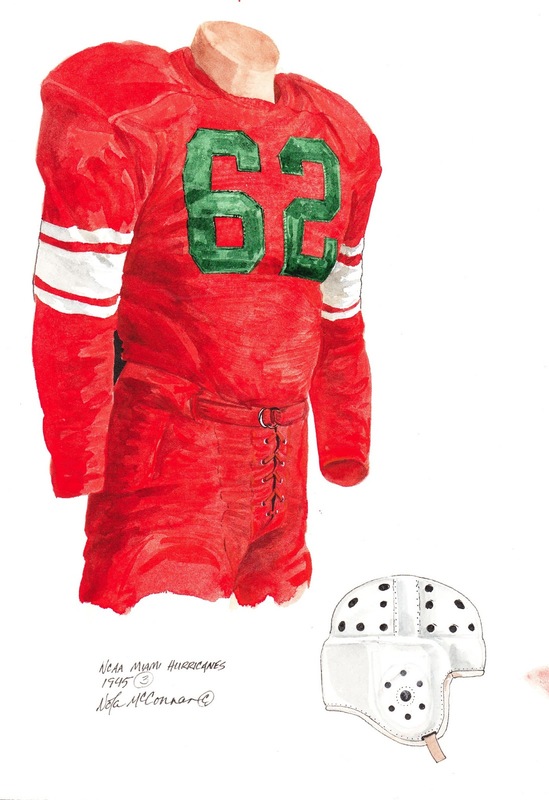 This painting depicts the #25 University of Miami football team uniform from 1950 that was worn by Hurricanes halfback - Frank Smith, a member of the University of Miami Sports Hall of Fame. The 1950 squad featured Miami’s first first-team All-American in Tackle, Al Carapella from Tuckahoe, New York. The 1950 Hurricanes enjoyed a breakthrough season under Head Coach, Andy Gustafson. The ‘Canes compiled a 9-1-1 record including wins over Purdue (20-14), Pittsburgh (28-0) and Florida (20-14). Miami lost a narrow 1-point decision to Clemson at the Orange Bowl on January 1, 1951. Coach Gustafson was inducted into the College Football Hall of Fame in 1985. Here’s what our friends at Wikipedia have to say about Andy Gustafson. Coach Gustafson is also enshrined in the University of Miami Hall of Fame. The Hurricanes of 1950 sported distinct white, long-sleeved jerseys with green numbers on both the front and back of the uniform and three green stripes at the elbow. Players also wore yellow pants with a single green stripe down the side of each pant leg. ‘Canes footballers wore white helmets. 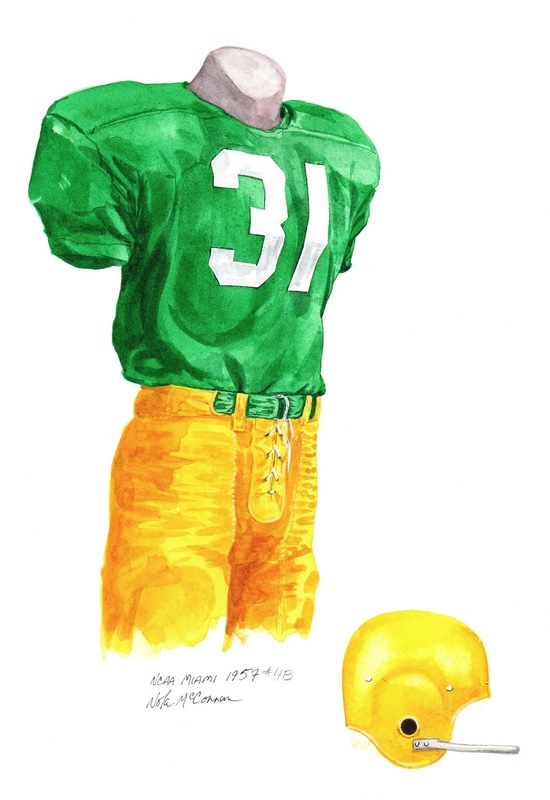 This painting depicts the #31 University of Miami football team uniform from 1957 that was worn by Captain - John Varone, a three-time Lettermen at Miami (1955-57). The 1957 Hurricanes posted a 5-4-1 record under the tutelage of Hall of Fame coach, Andy Gustafson. 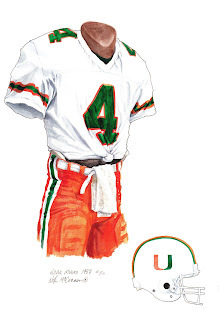 Miami’s 1957 uniform consisted of a green jersey with sleeves to the elbow and white numbers on both the front and back of the jersey. Players wore yellow pants and helmets. 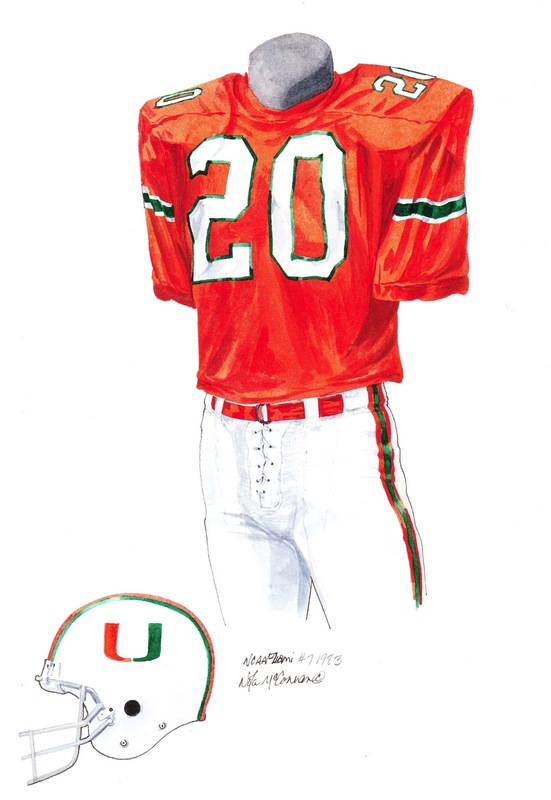 This painting depicts the #10 University of Miami football team uniform from 1961 that was worn by Hurricanes quarterback - George ‘The Matador’ Mira. Mira played seven seasons in the NFL mostly with San Francisco, the team that drafted him in the 2nd round of the NFL draft, 15th overall. Here’s what our friends at Wikipedia have to say about George Mira. Mira is enshrined in both the Florida and University of Miami Sports Halls of Fame. The 1961 Hurricanes posted a 7-4-0 record. All four losses came from a combined 17 points including a 15-14 upset by Syracuse at the Liberty Bowl. Head Coach Andy Gustafson was winding down his hall of fame career by 1963 and during his entire coaching career, Gustafson compiled a 115-78-4 record. The Hurricanes uniform of 1961 consisted of a white jersey with green numbers on the front and back and a white number over a green swath on the elbow-length sleeve. Players sported yellow pants and yellow helmets with green numbers on the side. Hendricks was a three-time All-American (1966-68) and finished fifth in the Heisman Trophy voting in 1968. He still holds many Hurricanes records and is enshrined in the University of Miami Sports Hall of Fame. In 1987, Hendricks was inducted into the College Football Hall of Fame. Hendricks, was drafted in the 2nd round, 33rd overall by the Baltimore Colts in 1969; he played 15 seasons in the NFL, predominantly with the Oakland/Los Angeles Raiders. Hendricks played in 215 straight regular-season games and also participated in eight Pro Bowl games, seven AFC championships and four Super Bowls. Ted was named All-Pro as a Colt in 1971, as a Packer in 1974, and as a Raider in 1980 and 1982. He was inducted into the Pro Football Hall of Fame in 1990. Here’s what our friends at Wikipedia have to say about Ted Hendricks. In 2000-01, College Football News ranked Hendricks as the 93rd greatest college football player of all-time. The ’68 Hurricanes turned in a .500 season (5-5) under the coach, Charlie Tate. Tate took over the head coaching duties from Andy Gustafson after the 1963 season. The Hurricanes uniform from 1968 featured below consisted of a green jersey with white numbers on the front, back and sleeves. The elbow length sleeves had a white cuff. 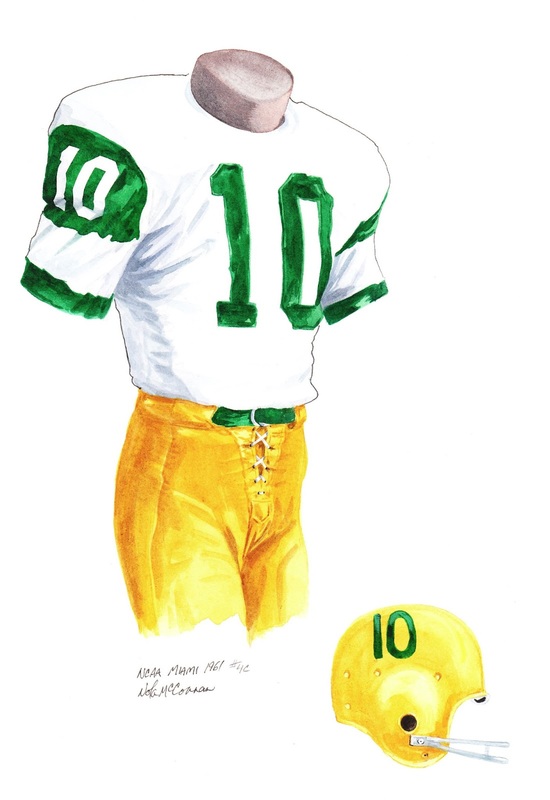 Players sported yellow pants with green and white stripes down the side of each pant leg. Players also sported gold helmets with a black and red ‘Hurricane Warning’ symbol on the side. 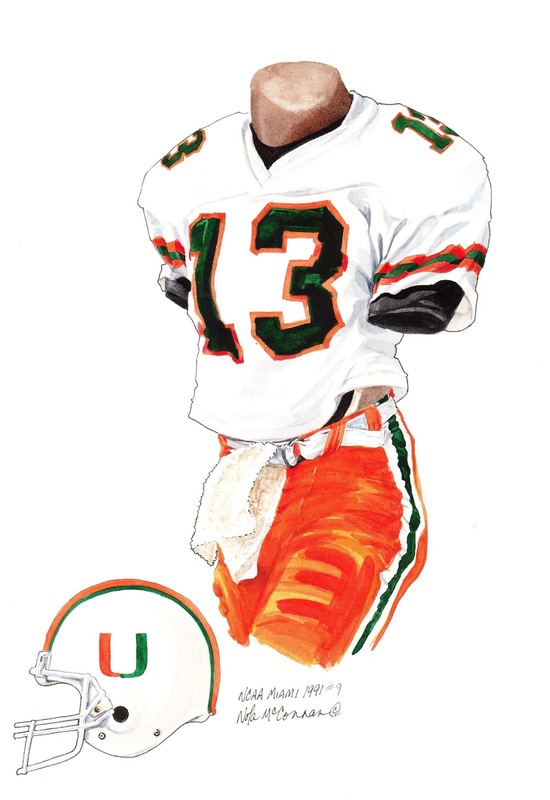 This painting depicts the #32 uniform of University of Miami football player - running back, Walter Eugene ‘Chuck’ Foreman. A native of Frederick, Maryland - Chuck Foreman achieved All-American status in 1972 and ranks near the top of many offensive categories for the Hurricanes. Foreman is enshrined in the University of Miami Sports Hall of Fame. Foreman was selected in the 1st round, 12th overall in the 1973 NFL draft by the Minnesota Vikings. He played 8 seasons in the NFL, predominantly with the Vikings. In his rookie season, Foreman was named AP Offensive Rookie of the Year and in 1976 he was voted UPI NFC Player of the Year. Here’s what our friends at Wikipedia have to say about Chuck Foreman. The ’70 Hurricanes posted a 3-8-0 record. Coach, Charlie Tate who had assumed the head coaching duties in 1964, was replaced after the second game of the season by Walt Kichefski. 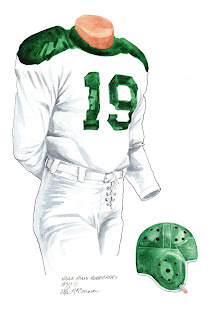 The 1970 Hurricanes uniform featured below consisted of a white jersey and green numbers with orange outlining. 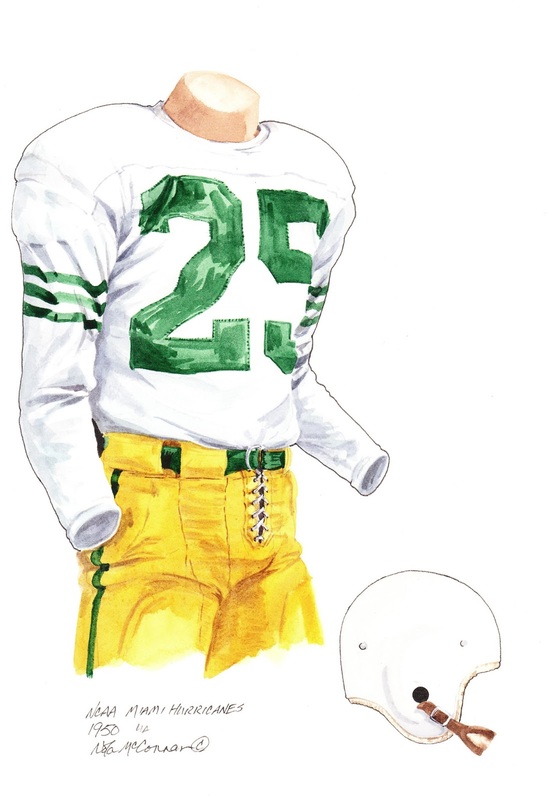 Orange and green stripes distinguished the jerseys along the sleeves, shoulders and seams. Players wore white pants with similar striping along the sides. Players also wore white helmets with an orange ‘UM’ logo on each side. 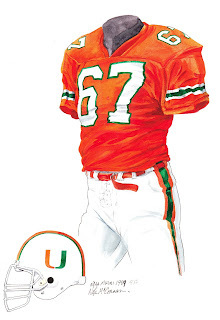 This painting depicts the #76 uniform of University of Miami football player - defensive tackle, Rubin Carter. Named first team All-American in 1974. A native of Pompano Beach, Florida, Carter parlayed an excellent collegiate career into a successful coaching career. He is enshrined in the University of Miami Sports Hall of Fame and is also a member of the Florida Track and Field Hall of Fame. In 2005, Carter assumed the Head Coaching duties at Florida A&M University after many years as a coach and player in the NFL. Carter played 12 seasons in the NFL, all with the Denver Broncos. He was drafted in the 5th round, 121st overall in the 1975 NFL draft. Here’s what our friends at Wikipedia have to say about Rubin Carter. The ’74 Hurricanes posted a 6-4-0 record under head coach, Pete Elliott. Elliott assumed the head coaching duties in 1973 and was replaced by Carl Selmer after the ’74 season. 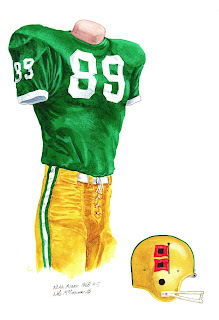 The 1974 Hurricanes uniform featured below consisted of a green jersey with white numbers on the front, back and sleeves. The pants were white with green and orange stripes down each side. Players sported a green helmet with an orange and green ‘U’ logo. This painting depicts the #20 uniform of University of Miami football player - quarterback, Bernie Kosar. In 1999, Bernie Kosar was added to the University of Miami Ring of Honor; his name and number are displayed in the Orange Bowl. A native of Boardman, Ohio, Kosar led the Hurricanes to an 11-1-0 record en route to a National Championship that was highlighted by a thrilling 31-30 victory over Nebraska at the Orange Bowl on January 2, 1984. Kosar is enshrined in the University of Miami Sports Hall of Fame. The Cleveland Browns used their controversial #1 overall pick to select Kosar in the 1985 NFL Draft; he would go on to play 12 seasons in the NFL, mostly with the Browns. Here’s what our friends at Wikipedia have to say about Bernie Kosar. The ’82 Hurricanes lost their season opener to the Florida Gators and then rebounded with 11 straight victories. The ‘Canes were coached by Howard Schnellenberger, who assumed the head coaching duties in 1979 and gave way to Jimmy Johnson following the team’s triumphant national championship campaign. The 1982 Hurricanes uniform featured below consisted of an orange jersey, white numbers with green outlining on the front, back and shoulders. The jerseys also featured white and green striping on the sleeves. Players sported white pants with green and orange striping down each side. White helmets with orange and green striping and an orange and green ‘U’ logo were worn for protection. Miami was the National Champion in 1983 and they capped off their championship season by beating Nebraska 31-30 in the Orange Bowl Classic. This painting depicts the #4 uniform of University of Miami football player - quarterback, Steve Walsh. Walsh helped lead the ‘Canes to a perfect 12-0 season and a National Championship. In 1988, the St. Paul, Minnesota native earned All-American status. Walsh played 10 seasons in the NFL before retiring in 1999. Walsh is enshrined in the University of Miami Sports Hall of Fame. Here’s what our friends at Wikipedia have to say about Steve Walsh. The ’87 Hurricanes enjoyed one of the best seasons in college football history. Miami began the year with a 31-4 thrashing of rival Florida and along the way also defeated Arkansas, Florida State, Virginia Tech, and Notre Dame before outlasting Oklahoma 20-14 in the Orange Bowl on January 1, 1988. Head Coach, Jimmy Johnson led the powerhouse Hurricanes to a National Championship. The ‘Canes squad featured Walsh, Michael Irvin, Melvin Bratton, Bubba McDowell, Jeff Feagles and All-Americans’ Bennie Blades and Daniel Stubbs. Johnson coached in Miami for five seasons, compiling a record of 52-7. In 1988, the Canes lost just one game, by a single point to Notre Dame and finished the season ranked #2. 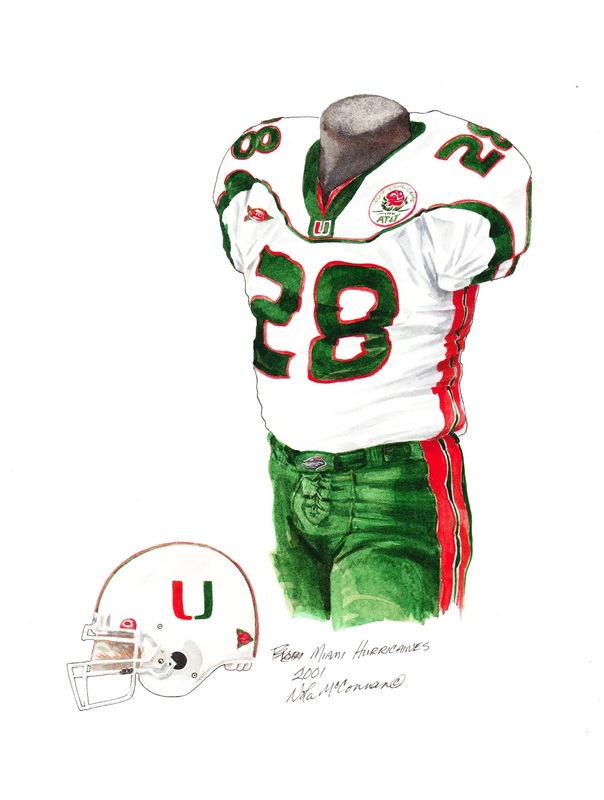 The 1987 Hurricanes uniform featured below consisted of a white jersey, green numbers with orange outlining on the front, back and shoulders. The jerseys also featured green and orange striping on the sleeves. Players sported orange pants with green and white striping down each side. The familiar white helmet with orange and green striping and an orange and green ‘U’ logo were worn for protection. Miami was the National Champion in 1987 and they capped off their undefeated season by beating Oklahoma 20-14 in the Orange Bowl. This painting depicts the #67 uniform of University of Miami football player - defensive tackle, Russell Maryland - college football’s Outland Trophy winner in 1990. Maryland and a stellar supporting cast of Hurricanes wrestled the National Championship in 1989 with a 33-25 defeat of Alabama in the Sugar Bowl. The native of Chicago earned All-American honors in 1990 and is also a member of the University of Miami Sports Hall of Fame. Here’s what our friends at Wikipedia have to say about Russell Maryland. The Dallas Cowboys, with former Hurricanes head coach, Jimmy Johnson at the helm used their first overall selection in the 1991 NFL Draft to select Maryland. The Cowboys with Maryland anchoring their defensive line captured three Super Bowls in four years; Maryland played 10 seasons in the NFL. The ’89 Hurricanes, with newly minted Head Coach, Dennis Erickson posted an 11-1 record that included a victory over the Crimson Tide at the Sugar Bowl on New Years Day. The ‘Canes only loss came to cross-state rival - Florida State. 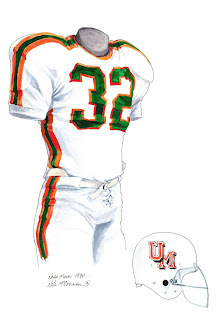 The 1989 University of Miami football uniform featured below consisted of an orange jersey and white numbers with green outlining on the front, back and shoulders. The jersey also featured green and white striping on the sleeves. Players sported white pants with green and orange striping down each side. The familiar white helmet with orange and green striping and an orange and green ‘U’ logo were worn for protection. This painting depicts the #13 uniform of University of Miami football player - quarterback, Gino Torretta. Despite backing up Craig Erickson for two seasons at Miami, Torretta showed signs of future greatness with a record-setting performance against San Jose State in his freshman year of 1989. As a starter in 1991, Torretta led the ‘Canes to an undefeated (12-0) season and a co-national championship. Torretta is a member of the University of Miami Sports Hall of Fame. In 1992, Torretta guided the Hurricanes to within a single game of a repeat national championship, losing to Alabama 34-13 in the Sugar Bowl. Despite the heartbreaking performance, Torretta garnered numerous awards including the coveted Heisman Trophy, the Davey O'Brien Award, the Johnny Unitas Award, and the Maxwell Award. Here’s what our friends at Wikipedia have to say about Gino Torretta. Torretta played sporadically in the NFL from 1993 to 1997. Dennis Erickson’s tremendous run of success at Miami continued in 1991 as he guided the ‘Canes to a 12-0 record including a shutout win over Nebraska at the Orange Bowl. Erickson compiled a 63-9-0 record over his six years at Miami; however, three of those losses came in three consecutive bowl appearances. The 1991 University of Miami football uniform featured below consisted of a white jersey and green numbers with orange outlining on the front, back and shoulders. The jersey also featured green and orange striping on the sleeves. Players sported orange pants with green and white striping down each side. The familiar white helmet with orange and green striping and an orange and green ‘U’ logo were worn for protection. In a year of disputed National Champions, Miami was the 1991 AP National Champion and they capped off their undefeated season by beating Nebraska 22-0 in the Orange Bowl. 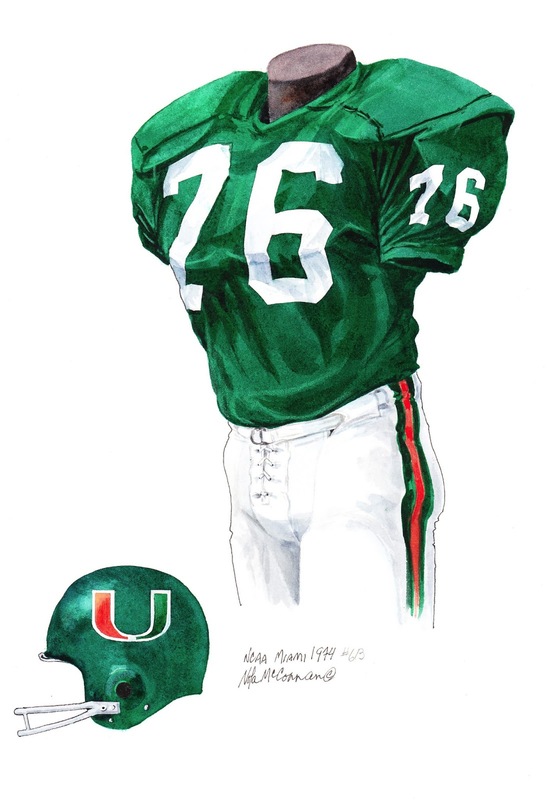 This painting depicts the #28 uniform of University of Miami football player - running back, Clinton Portis. Portis became just the second true freshman to start at running back for the ‘Canes since the 1975 season. His sophomore season wasn't as successful as he lost his job to James Jackson; however, Portis bounced back in 2001 as the Hurricanes won the National Championship. In the Rose Bowl against Nebraska, Portis ran for 104 yards on 20 carries including a 38-yard touchdown in the 37-14 win over the Cornhuskers. Here’s what our friends at Wikipedia have to say about Clinton Portis. The Denver Broncos selected Portis in the second round of the 2002 NFL Draft (51st overall). Portis was named the AP Offensive Rookie of the Year in 2002. Larry Coker led the Hurricanes to a perfect 12-0 season in his first year as head coach at Miami. The ‘Canes feature six All-Americans on their roster including cornerback - Phillip Buchanon, tight-end - Jeremy Shockey, and strong safety - Edward Reed. 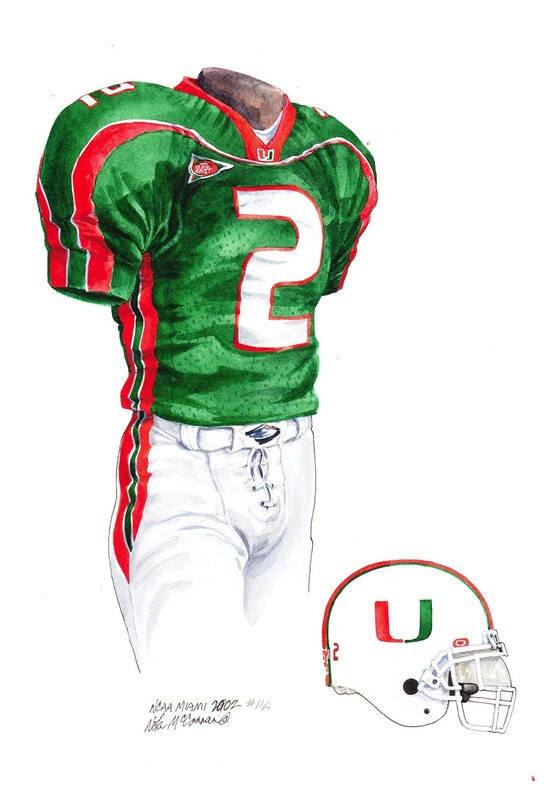 The 2001 University of Miami football uniform featured below consisted of a white jersey and green numbers with orange outlining on the front, back and shoulders. The jersey also featured green and orange striping at the seams on the torso and green and orange stripes across the chest and shoulders. 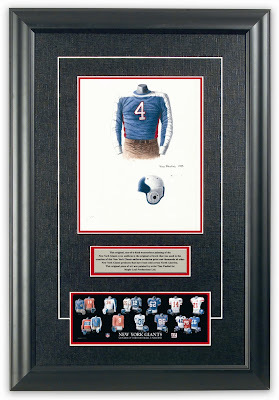 This jersey also contains three patches; an ‘AT&T Rose Bowl’ patch on the left chest, a ‘Big East’ patch on the right chest and ‘U’ patch at the V of the collar. Players’ pants were green with a orange and white stripes down each side. The familiar white helmet with orange and green striping and an orange and green ‘U’ logo were worn for protection. Miami was the National Champion in 2001 and they capped off their undefeated season by beating Nebraska 37-14 in the Rose Bowl. This painting depicts the #2 uniform of University of Miami football player - running back, Willis McGahee. McGahee was a member of the Hurricanes 2001 national championship team. The 2002 ‘Canes featured four All-Americans including McGahee, quarterback - Ken Dorsey, defensive end - Jerome McDougle, and center - Brett Romberg. Here’s what our friends at Wikipedia have to say about Willis McGahee. The Buffalo Bills selected McGahee with their 23rd overall pick in the 2003 NFL Draft. The Bills traded McGahee to the Baltimore Ravens for third and seventh round picks in the 2007 NFL Draft, and a third round pick in the 2008 NFL Draft - here is a summary of his NFL career. The 2002 Hurricanes carried a perfect 12-0 record into their showdown with Ohio State at the January 3, 2003 Fiesta Bowl. Ohio State prevailed with a controversial 31-24, double-overtime victory. McGahee was injured in the 4th quarter with what turned out to be three ruptured ligaments in his knee. The 2002 University of Miami football uniform featured below consisted of a green jersey and white numbers with orange outlining on the front, back and shoulders. The jersey also featured white, green and orange striping at the seams on the torso and white and orange stripes across the chest and shoulders. This jersey also contains two patches; a ‘Big East’ patch on the right chest and ‘U’ patch at the V of the collar. Players’ pants were white with orange and green stripes down each side. The familiar white helmet with orange and green striping and an orange and green ‘U’ logo were worn for protection. 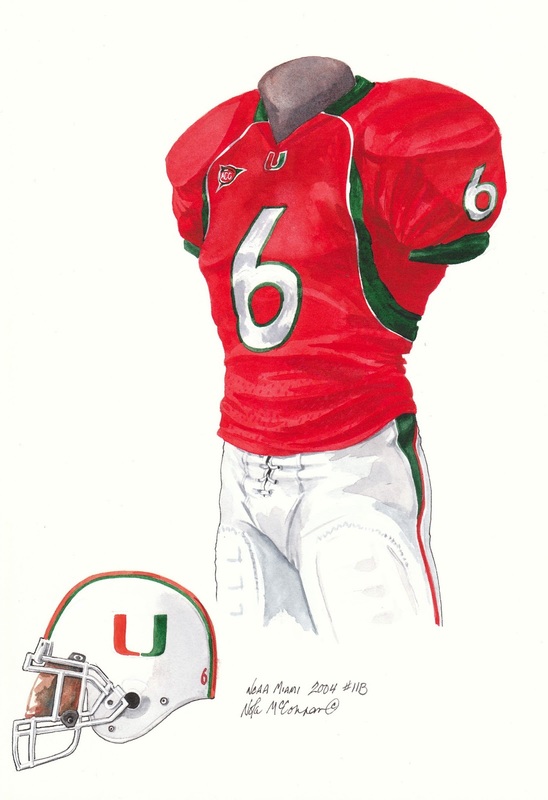 This painting depicts the #6 uniform of University of Miami football player - cornerback, Antrel Rolle. In 2004, Rolle was a consensus All-American and also lettered all four years at Miami (2001-04). Here’s what our friends at Wikipedia have to say about Antrel Rolle. The Arizona Cardinals used their 8th overall pick in the 2005 NFL Draft to select Rolle - here is a summary of his NFL career. The 2004 Hurricanes under Larry Coker posted a 9-3-0 record that included a 27-10 victory of cross-state rival - Florida Gators. The ‘Canes suffered three losses in their last five regular season games and finished the season ranked #11. The 2004 University of Miami football uniform featured below consisted of an orange jersey and white numbers outlined in green on the front, back and sleeves. 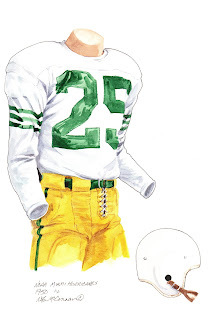 The jersey also contains green cuffs on the elbow-length sleeves and a green and white swath that runs from the collar, down one side of the chest, around the back and up the other side of the chest to the collar. Players wore white pants with a green and orange stripe down each side. The familiar white helmet with orange and green striping and an orange and green ‘U’ logo were worn for protection. This jersey also contains two patches; an ‘ACC patch on the upper right chest and Miami’s ‘U under the V of the collar. 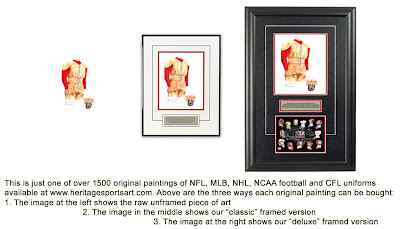 If you love the University of Miami and the history of 'Canes football, you might really love to own an original piece of artwork celebrating the team's historic uniforms as seen in the poster at the top of this blog - you can actually own one of those original pieces of art! There are only 16 pieces of original art available for sale, and when these 16 are sold, that's it, they're all sold out. If you would like more information about this great artwork including the three ways you could purchase each piece, please visit our Miami Hurricanes YouTube video at www.youtube.com/watch?v=CJ1iaJ3CdQ8 or go directly to the artwork website www.heritagesportsart.com/Miami-Hurricanes-c85/ where you can see and purchase the artwork. I want to see LSU football uniforms,please.